Barbershop vocal harmony, as codified during the barbershop revival era (1930s–present), is a style of a cappella close harmony, or unaccompanied vocal music, characterized by consonant four-part chords for every melody note in a predominantly homophonic texture. Each of the four parts has its own role: generally, the lead sings the melody, the tenor harmonizes above the melody, the bass sings the lowest harmonizing notes, and the baritone completes the chord, usually below the lead. The melody is not usually sung by the tenor or baritone, except for an infrequent note or two to avoid awkward voice leading, in tags or codas, or when some appropriate embellishment can be created. One characteristic feature of barbershop harmony is the use of what is known as "snakes" and "swipes". This is when a chord is altered by a change in one or more non-melodic voices. Occasional passages may be sung by fewer than four voice parts. Barbershop music is generally performed by either a barbershop quartet, a group of four singers with one on each vocal part, or a barbershop chorus, which closely resembles a choir with the notable exception of the genre of music. The same chord with just intonation, as tuned by singers to "ring"
Historical memoirs and journalism indicate a strong tradition of quartet singing among young African American men, gathering informally to "crack up a chord". This was acknowledged as early as 1882, when a New York Age writer traced the development of this singing as a home-grown amusement, arising from the exclusion of Blacks from theaters and concert halls. Jazz musician Louis Armstrong told of having harmonized on New Orleans street corners as a boy, and NAACP executive secretary James Weldon Johnson "grew up singing barbershop harmony". English "barber's music" was described in the 17th century by Samuel Pepys as amateur instrumental music. The Encyclopædia Britannica considers the 19-century origins of the quartet style as "obscure", possibly referring back to barber's music, or dating to when barbershops served as community centers, where men would gather for social and musical activities with barbers traditionally being musicians. Later, white minstrel singers adopted the style, and in the early days of the recording industry their performances were recorded and sold. Early standards included songs such as "Shine On, Harvest Moon", "Hello, Ma Baby", and "Sweet Adeline". Johnson noted in the 1920s how the genre had already crossed racial barriers. Barbershop music was very popular between 1900 and 1919, and some of the most popular quartets were the Haydn Quartet, the American Quartet, and the Peerless Quartet. Modern barbershop quartets often costume themselves in gaudy versions of the vaudeville dress of this time, with boaters and vertically striped vests. Composer and pianist Scott Joplin incorporated a barbershop quartet into his 1911 opera Treemonisha. The genre gradually faded into obscurity in the 1920s, although barbershop-style harmonies remained in evidence in a cappella forms of traditional black gospel and white gospel. Traditionally, the word "barbershop" has been used to encompass both men's and women's singing in the barbershop style – in quartets and choruses. Sweet Adelines International and Harmony, Inc. are two women's barbershop singing organizations that operate globally and in North America, respectively. Other women's organizations include the Ladies Association of Barbershop Singers (LABBS) in the United Kingdom, the Spanish Association of Barbershop Singers (SABS) in Spain, and the Irish Association of Barbershop Singers (IABS) in Ireland. A barbershop chorus sings a cappella music in the barbershop style. Most barbershop choruses belong to a larger association of practitioners such as the Barbershop Harmony Society, Sweet Adelines International LABBS (Ladies Association of British Barbershop Singers), BABS (British Association of Barbershop Singers) or Harmony, Inc. The Masters of Harmony, nine-time International Chorus Champions. Based in Los Angeles County, California. The Ambassadors of Harmony, 2004, 2009, 2012, and 2016 International Chorus Champions. Based in St. Charles, Missouri. Chorus of the Chesapeake, two-time International Champion chorus, based in the Baltimore, Maryland area. The Great Northern Union, based in Minneapolis/St. Paul, Minnesota, consistent top-ten finisher and nine-time International Chorus Medalists. Voices of Gotham, based in Hell's Kitchen, New York City, are the 2011 Mid-Atlantic District Champions and a top-ten finisher in the international competition in 2013, 2015, and 2017. Pacific Coast Harmony, based in La Jolla, California, small Far Western District chorus that competed internationally in 2005, 2006, 2012 and 2017. The Cottontown Chorus: Five times British champions in 2005, 2007, 2009, 2011 and 2013; four times BABS silver medalists (2001, 2002, 2004, 2015) and bronze medalist for 2003; European Barbershop Convention silver medalists for 2005 and 2009; winners of the adult section of BBC Radio 3 Choir of the Year for 2008; Irish Association of Barbershop Singers international gold medalist for 2008; winning chorus at the Manchester Amateur Choral Competition for 2008; four-time BHS International competitor, in 2006, 2010, 2014, and 2017; based in Bolton, Greater Manchester, England. The Great Western Chorus of Bristol winners of a record ten gold medals (1977, 1980, 1981, 1983, 1990, 2008, 2010, 2015, 2017), four times BABS silver medalists and five times bronze medalists. The Great Western Chorus hold more chorus competition medals than any other chorus in the association; Radio 3 "Choir of the Year" 2006 Finalists; based in Bristol, England. They won the inaugural Barnardo's Adult Male Choir Competition, have always placed within the top five nationally, and are one of two choruses to have won contests back to back due to the "Year Out" rule (wherein a chorus that wins the national contest takes a year out) not being active at the time. They competed at the International contest in 2009 and 2011, and are scheduled to do so again in 2018. The Grand Central Chorus: Five times British Champions (1993, 1996, 2001, 2003, 2012); four times BABS silver medalists (2005, 2006, 2007, 2016); winner of the 2016 Ladies Association of British Barbershop Singers Performance Award; based in Long Eaton, Derbyshire, England. Lace City Chorus, six-time (four times consecutively) Sweet Adelines Region 31 Gold Medal chorus from Nottingham, United Kingdom. Scottsdale Chorus, five time Sweet Adelines International Chorus Champions from Region 21, Scottsdale Arizona. Lady Barbalade, 2018 IABS national female quartet champions with the highest national female quartet score ever at IABS, from Dublin. Blingmasters, 2018 IABS national female chorus champions with the highest national female chorus score ever at IABS, from Dublin. ^ Mook, Richard. "Barbershop Quartet Singing". Oxford Music Online. Oxford University Press. Retrieved January 9, 2017. ^ "Definition of the Barbershop Style, from the Contest and Judging Handbook". Barbershop Harmony Society. July 11, 2002. Archived from the original on June 7, 2007. Retrieved June 6, 2007. ^ a b c Averill, Gage (2003). Four Parts, No Waiting: A Social History of American Barbershop Harmony. Oxford University Press. p. 164 and 166. ISBN 0-19-511672-0. ^ Muir, Lewis (music); Tracy, William (lyrics) (1910). Play That Barber Shop Chord. New York: J. Fred Helf. ^ a b c Döhl, Frédéric (2014): From Harmonic Style to Genre. The Early History (1890s–1940s) of the Uniquely American Musical Term Barbershop. American Music 32, no. 2, 123–171, here 123–124. "In recent years, new insights and greater clarity have been acquired, which include aesthetic issues relating to sound, some answers to questions of race, gender, and other social factors shaping the genre, and exploration of the ideology surrounding the so-called revival around 1940. Still, the debate about the origins of this genre seems to be widely unsettled. The current models that chart the birth of barbershop harmony are diverse and often contradictory with regard to categories such as race, gender, regional context, social environment, amateur or professional, impromptu or composed-arranged, and highbrow or lowbrow." ^ a b c d e Abbott, Lynn (1992). "'Play That Barber Shop Chord': A Case for the African-American Origin of Barbershop Harmony". American Music. University of Illinois Press. 10 (3): 289–325. doi:10.2307/3051597. ^ a b c Wright, David (January 2015). "The African-American Roots of Barbershop (and why it matters)" (PDF). The Harmonizer: 10–15. Retrieved February 7, 2018. ^ "Barbershop quartet singing". Encyclopædia Britannica. Retrieved February 5, 2018. ^ Everett, Dianna (2009). 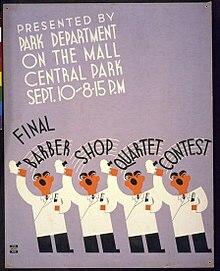 "SPEBSQSA (Society for the Preservation and Encouragement of Barber Shop Quartet Singing in America)". The Encyclopedia of Oklahoma History and Culture. Oklahoma Historical Society. Retrieved February 5, 2018. ^ "History of the Barbershop Quartet, A Time-Honored Tradition". May 8, 2012. Retrieved July 23, 2012. ^ "Take 6". Primarily A Cappella. ^ Henry, James Earl (2000). The Origins of Barbershop Harmony: A Study of Barbershop's Links to Other African American Musics as Evidenced through Recordings and Arrangements of Early Black and White Quartets. Washington University. ^ Averill, Gage (2003): Four Parts, No Waiting. A Social History of American Barbershop Harmony. New York: Oxford University Press. ^ Garnett, Liz (2005): The British Barbershopper: A Study in Socio-musical Values. London: Ashgate. ^ Triplett, Gene (March 10, 1985). "Barbershop Quartets To Trim Tunes at Show". NewsOK. Retrieved January 13, 2014. ^ "Keeping The World In Harmony". CBS News. October 18, 1999. Retrieved January 13, 2014. ^ "Who is the Barbershop Harmony Society?". Barbershop Harmony Society. Archived from the original on January 14, 2014. Retrieved January 13, 2014. ^ "Chorus Contest Scores". Barbershop Music Database. Retrieved October 14, 2016. ^ "Chorus Locator". British Association of Barbershop Singers. Retrieved August 8, 2016. ^ "Official Results". Barbershop Harmony New Zealand. Retrieved March 22, 2017. ^ "Irish Association of Barbershop Singers". Irish Association of Barbershop Singers. Retrieved October 31, 2016. Henry, James Earl (2000): The Origins of Barbershop Harmony: A Study of Barbershop's Musical Link to Other African-American Musics as Evidenced Through Recordings and Arrangements of Early Black and White Quartets (PhD diss., UMI Microform 9972671, Washington University in St. Louis). Ann Arbor: ProQuest. Nash, Jeffrey Eugene (2013): Puttin' on Your Face: Staged Emotions among Barbershop Singer. The Drama of Social Life: A Dramaturgical Handbook, ed. Charles Edgley. Farnham: Ashgate, 229–244.